The state of Indiana is known for auto racing, producing Will Shortz, being basketball crazy, and apparently also for Senator Joe Donnelly. Donnelly (D-IN) has held the seat since 2013. 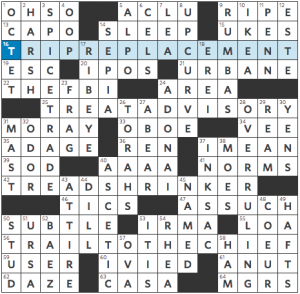 He co-authored today’s puzzle, the latest entry in the series of celebrity-created puzzles that started in 2017. 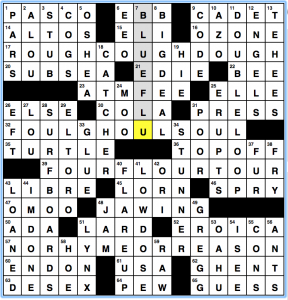 We’re no longer celebrating the crossword’s 75th anniversary; according to today’s Wordplay post, this feature was so popular they kept making them. The Senator’s co-author is also from Indiana. Appropriately enough, the theme answers are all basketball terms with punny clues. 15a [Warning during a heist?] is a BANK SHOT. That one made me raise an eyebrow; it evokes dead bank tellers more than cutesy puzzle answers. 18a [Gutterball?] is ALLEY OOPS. Much better. Light and funny. 37a [Dinner at the end of Ramadan?] is FAST BREAK. 57a [Rug store promotion?] is FREE THROW. That one made me chuckle. 64a [Something bleeped out for television?] is FOUL LINE. Aside from 15a, they’re all solid and at least somewhat amusing. Nice. 1a [Exchange of words] is DIALOG. This never looks right to me. I want DIALOGUE instead. The Google Ngram viewer tells us that DIALOG was not present until the 1980s, and has risen quickly to be the more common spelling. I learned to spell in the mid-1960s, so I guess that explains it. 3d [Digital media player that’s “big” in New York City?] is the APPLE TV. Yes, I understand that this is a play on “big apple.” The entry is fine; the clue is forced and contrived. [The end of the British monarchy?] shows up at 26d and 52d, with ZED and ARSE, respectively. Baseball shows up in the basketball puzzle with 35d [Two-bagger: Abbr.] for DBL. Meh. More sports: 45d [An ejected player might be sent to them] is, of course, the SHOWERS. People who complain about sports in puzzles will not like this one. What I didn’t know before I did this puzzle: that Indiana elected a Democratic Senator. The title makes a good basis for a theme. Though it does telegraph what’s going to happen in the grid (Hs are changed to TRs), I still found it cute. 16a [Staycation?] TRIP REPLACEMENT. Hip…I imagine there was a lot of TRIP REPLACEMENT going on during the recent bomb cyclone event. 25a [Notice when the cookies are all gone?] TREAT ADVISORY. Heat…I recently moved the cookies that had been sitting on the counter into the cookie jar (where, counterintuitively, my daughter couldn’t find them) without so much as a TREAT ADVISORY. Consequently, I got to have them all. Mwah ha ha! 42a [One who reduces your car’s footprint?] TREAD SHRINKER. Head…Hmm. Not sure that shrinking your tread would actually reduce your footprint. There’d still be the same amount of surface area touching the road. But I’m picking nits. 56a [Path ending at Sitting Bull’s tepee?] TRAIL TO THE CHIEF. Hail… See photo. 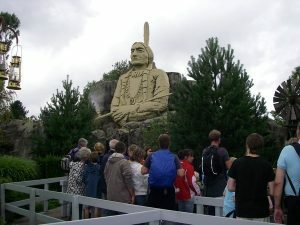 The TRAIL TO THE CHIEF could also be this line to view Lego Sitting Bull at Legoland in Denmark. Fairly standard letter-substitution theme, but having a basis for it (the title) elevates it, and all the theme entries work reasonably well. A lot of hit and miss in the fill, though. The SPICE TRADE (3d, [Venice controlled it in the 14th century]) has got some zing, but OVERRULING is more vanilla. Considering each of those words crosses three theme entries, that’s pretty good. I like vowel-heavy ADONAI, but I’m giving plural TORAHS the side-eye. I like RIB-EYE, URBANE, and INKSAC but I’m not so sure about UPCURVE and THE FBI which felt odd with its inclusion of the definite article. And then there’s the usual RIPE stinkers like ERE I, AAAA, OOP, and ESTE. Speaking of which, ESTE is clued [Noble house of Italy]. I don’t recall seeing that word clued that way before. I don’t feel like looking them up. Anyone? The other clue that got me was for CAPO [Guitar bar]. Apparently it is a device which clamps down across the fingerboard at a particular fret. Anyone ever use such a thing? Not much else to say. Cute theme, consistently executed. The fill isn’t so lively, but it certainly works. Ah, yes, the many weird ways English can be weird, similar to how Arkansas and Kansas aren’t pronounced the same way, much to non-English speakers’ consternation. ROUGH, COUGH, and DOUGH all have different pronunciations of that OUGH sound, etc. etc. A police protest that uses illness as a pretext is BLUE FLU, not my initial thought of it being a BLUE OUT. The LYNX is the national animal of Romania. Who knew? I don’t fully get the WRAP part, but the circled parts of the three entries spell out popular-in-the-US sandwiches: TUNA, EGG and HAM. The reveal is SANDWICHWRAPS. Entries are CAUGHTUNAWARE, a tiny NUTMEGGRATER and NORTHAMERICA. 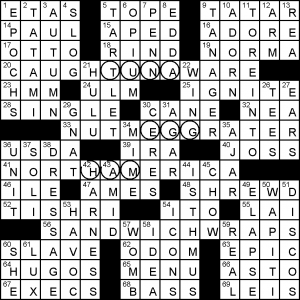 We get a double dose of six-letter crossword-ese with Japanese TATAMI and Jewish month TISHRI; I can see many less wizened crossword solvers working crossers here. This entry was posted in Daily Puzzles and tagged Adam T. Cobb, Byron Walden, Michael S. Maurer, Paul Coulter, Senator Joe Donnelly. Bookmark the permalink. I’m not one to complain about sports in puzzles, at least when they’re accurate. I thought the clue for HITTER was inaccurate. I think of batter and hitter as pretty much synonymous. A “successful batter” is a BASERUNNER, right? I wouldn’t call in inaccurate. Not idiomatic perhaps. But there are contexts where “hitter” means “batter who gets hits.” A “power hitter,” for instance is a power hitter because of bases acquired per at-bat. And the classic encouragement to the batter, “Be a hitter!,” implies a successful hitter. It wouldn’t make sense to interpret “hitter” here as “batter,” since you’re yelling it at the batter. So this baseball fan didn’t find this as clunky as, admittedly, some sports clues have been. Regarding “be a hitter,” I always interpreted that, at least in my Little League days, as something like “be aggressive, swing the bat, try to get a hit as opposed to working a walk.” I don’t think it’s literally a command to get a hit. Watch a major league baseball game on TV, no outs, first batter hits a double, next batter, (right-handed), works hard to hit to right field (and on the ground to avoid being an easy out that doesn’t advance the runner), grounds out to second baseman, who had to move to his left to catch the grounder. Runner on second moves to third, giving him the opportunity to tag up and score a run on a long fly ball out to any outfielder. The batter (HITTER) returns to the dugout getting high fives from coaches and teammates who feel he was, indeed, a “Successful batter”. I admit that your point might have sailed over my head. I can also describe a scenario: a perfect game. The pitcher retires 27 hitters in a row. No hitter reaches first base. Hitter after hitter makes an out. They are all 100% unsuccessful and yet I call them hitters without contradiction. Never heard “hitter” used that way and thought it off. Lifelong baseball fan here, and I concur that the clue does not work idiomatically. BATTER and HITTER are synonyms. Doesn’t matter whether the hitter gets a hit in that particular at-bat. Nobody bats .000 for long. Alleyoops are usually nothing but net dunks, but they can also be a bank shot. I cringed at ALLEY OOPS for the reason I always do. The clue is not as inaccurate as most bowling related clues in the sense that a gutterball occurs in a bowling establishment (ALLEY), but it literally occurs on a bowling LANE. HITTER did not bother me. AVCX – Nice idea, and I especially liked the revealer, but one of the intended eye-rhymes leaves me perplexed. I’m curious – does anyone live in an area where FOUR and TOUR are not pronounced as rhymes? I say them differently: “fore” and “toour”. I am from Phoenix, and live in Central Virginia, but the latter accent has not taken over my speech as far as I know. Yes, here, to CAPO use when playing the guitar. Also, thinking back to the Great Pecan Pronunciation Debate, a friend (who says “peCAN”) sent me this fun web site about mapping food dialect trends across the U.S.
I’d be interested to see where some of us stand! I’m mostly New England (perhaps because my mother was Canadian) and some Virginia. Like Lise’s friend, I say “peCAN” (“puhCAN,” not “peeCAN”) and so found the pecan map weird, as my pronunciation wasn’t listed. I’m from and in Brooklyn, New York. Some people I know go for “puhCAHN,” though. Though I found the omission annoying, the maps are fun. This is fascinating. I am from NY/NJ and it would never occur to me that FOUR and TOUR could be pronounced as non-rhyming. To me, they both rhyme exactly with “tore” and “fore” and “boar” and “door” and “gore” and “soar” and “pour” … I can’t hear any difference in the vowel sounds of any of those words. I had a different problem with the AVCX. In the first theme entry I had TOUGH instead of ROUGH, which makes an equal amount of sense, and was then left with PATS instead of PARS. Was left scratching my head about the clue and it never occurred to me that I just had the wrong word. I say them differently and I’m in central Texas. Up in Washington, FOUR is a homophone with for, and TOUR is pronounced like a smushed together “two-er”. About ESTE: I have seen it mostly in clues like “Villa d’____”. I haven’t seen it in quite a while. Re “Dialog” vs “Dialogue” – I’m on board with that also, to the point of finding the spelling somewhat grating. In the old days, Ann Landers (or was it her sister?) used to criticize smoking “cigarets” in her column, which I found equally harsh. I didn’t quite like “ZED” as “The End of the British Empire”, but it works well paired with “ARSE”. I think both examples are beyond reason. It’s too much of a stretch to say that ZED is the end of the British Empire and for it to work as ARSE, the clue would need say “rear end”, not simply “the end”. Does anyone say, “Get off your end and get busy”? I always go with MW11C and RHUD in preferring CATALOG but DIALOGUE. However, they do list the alternative spellings, and I assume that crosswords have that option without signaling, unless the alternative is specific to something (archaic, British, whatever). NYT: I surely agree with Noam here, except that I feel more kindly about special-interest puzzles in general for when my own interests are referred to ([Sam] LEVENE! Starring last night on TCM), though sports puzzles usually make me unhappy for myself on the days they occur, since I know little about most sports. I don’t agree with Jenni today that “People who complain about sports in puzzles will not like this one.” Although I am missing half the humor and depth of the puzzle by not knowing almost anything about basketball, the puzzle is clued with non-sports clues for the theme answers, so that anyone can get those theme answers. 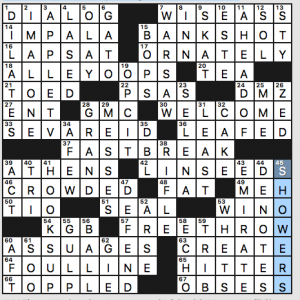 There are a few specific sports clues in the puzzle (Spalding, two-bagger, a joke about batters, SHOWERS), but they are not specialist clues and they are gettable. A delightful bit of outreach, in my opinion! Joe Donnelly, send me a donation envelope. Michael Maurer, great collaboration! Thanks! I’m a fair bit younger than you are, Zulema, and it was also a gimme for me – without any letters. Ditto, and I’m younger still.